Many myths perpetuate in the world of copyright. There are myths about copyright term, copyrightability, and the most important exception to copyright: fair use. Fair use is, of course, an essential right that allows the use of copyrighted material without permission from the rightholder under certain circumstances. Without fair use, we might not have the great technological advancements like DVRs and search engines. Without fair use, there would be no parody, no critique, or mash-ups. Without fair use, scholarship and education would be severely hampered. Unfortunately, some myths surrounding fair use serve to severely limit this essential right or might cause confusion about what is actually a fairly predictable doctrine with plenty of existing guidance. For Fair Use Week 2017, ARL commissioned an infographic on ten fair use myths and facts. This post focuses on two of those ten myths and facts. Myth: Fair use is a defense, or minor exception, not a right. Fair use must be viewed as a right because of its essential relationship to freedom of speech and expression. The Supreme Court has acknowledged the important role of fair use as a First Amendment “safeguard.” In Eldred v. Scott, for example, the Court noted that the idea-expression distinction for copyrightability standards and the fair use right are “generally adequate to address” First Amendment concerns and that these copyright elements serve as “built-in First Amendment accommodations.” The Court continues by explaining, because “The Copyright Clause and First Amendment were adopted close in time, [t]his proximity indicates that, in the Framers’ view, copyright’s limited monopolies are compatible with free speech principles. Indeed copyright’s purpose is to promote the creation and publication of free expression.” The “Copyright Clause,” of course, refers to the constitutional purpose of copyright to “promote the progress of science and the useful arts.” Fair use supports both this purpose and the First Amendment. In fact, the only way to square the potential restrictions that copyright places on speech with the guaranteed right to freedom of expression, a flexible mechanism must exist to ensure that copyright does not conflict with free speech. Because of the role of fair use in protecting the First Amendment, it is correctly viewed as a right. Myth: Where a specific limitation or exception exists under copyright law, fair use does not apply. Fact: Fair use is a right that exists in addition to specific exception. Even beyond the explicit savings clause under Section 108, fair use clearly works in tandem with other specific limitations and exceptions. The Authors Guild also tried to claim that HathiTrust’s provision of accessible format copies to those with print disabilities violated copyright. Although Section 121 of the Copyright Act provides for a specific exception for the creation and distribution of accessible works, the Second Circuit turned first to the fair use doctrine and found that this activity is, indeed, a fair use. As a result, the Second Circuit found “we need not consider” whether the activity was permitted under the specific exception in Section 121. While specific exceptions provide certainty for particular activities or apply where fair use does not, they do not exclude the applicability of fair use. Instead, the specific exceptions essentially provide a safe harbor while fair use accommodates not only other uses, but also responds to changes in technology or circumstances, effectively updating the specific exceptions. In fact, specific exceptions may actually be evidence that Congress recognizes a strong public policy interest in permitting these types of uses and the first fair use factor (the purpose and character of the use) should therefore tilt in favor of the user. Jonathan Band has written an excellent article, The Impact of Specific Exceptions on Fair Use, making this argument. The Association of Research Libraries, together with other library organizations and the Internet Archive, also advanced this argument recently in its amicus brief in Capitol Records v. ReDigi. Fair use is critical to a balanced copyright system and it’s a shame that there are so many myths around this important right. Hopefully we can continue to celebrate fair use every day—giving it a little bit of extra love this week—and help dispel some of these myths. 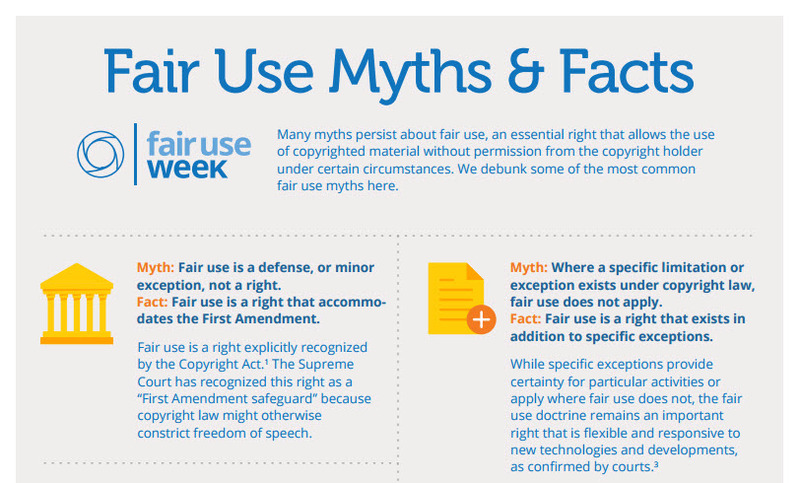 You can see all ten fair use myths and facts here and learn more about Fair Use/Fair Dealing Week here. *In his article, Professor Bauer argues that the idea-expression dichotomy and fair use doctrine ameliorate the conflict between the Copyright Act and the First Amendment, but that they are insufficient. He advocates for an external mechanism—beyond the internal mechanisms of the idea-expression distinction and fair use—to promote greater protections for the First Amendment.